If you understand the concept of index fund investing, you may be ready to invest but unsure about the mechanics of getting started. I'll show the steps of this process (and mention a few points that may be useful). Make sure you have money to invest. Verify that you have money in a bank account (checking or savings) ready to invest now or a steady source of income that gives you $100 or more extra cash each month. And, before you get started in investing, be sure you will not need this money to pay bills for a very long time. Brokerage account minimums typically range from $0 to $3,000, and fund minimums can range from $100 to $3,000. You can invest for less. For example, a while back, you could have invested $20 in Google (Alphabet) at Loyal3 without paying any fees (note: this program is ending and is no longer fee-free). To me, the point is getting started. But that $20 is unlikely to make much difference in long-term wealth unless you keep adding to that amount by either applying your year-end bonus (or Christmas gifts, extra cash, etc.) to buying more shares periodically or setting up an automatic investment on a recurring basis. Figure out what type of account you want to open. 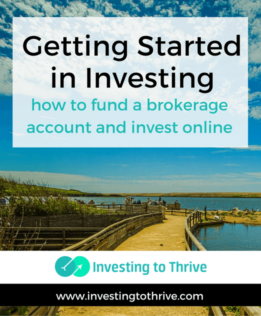 When you complete a brokerage account application, typically you'll need to choose the type of account you want to open. Generally, if investing for your own future, you'll open a regular brokerage account (taxable) or an IRA (tax-advantaged). Because of a couple of cool benefits, many people put money in a Roth IRA if they can. Depending on the circumstances, you may be able to withdraw your contributions from the Roth IRA without tax consequences. When you retire, you can take qualified distributions free of income taxes. Select an online brokerage firm. There are a lot of great online brokerage firms from which to choose. For example, you might open an account with E*Trade, Fidelity, Schwab,, or TD Ameritrade. Those firms allow you to invest in a variety of stocks, mutual funds, and ETFs at a relatively low cost starting with a relatively low account minimum. As an aside, you could open an investment account with a company that is not a discount, online brokerage firm. You could invest with the investment arm of your bank. For example, if you have a checking account with Wells Fargo, then you might open an investment account with WellsTrade. You might also consider newer, innovative firms such as Betterment, Motif Investing , and Loyal3 (now FolioFirst), each with unique advantages and drawbacks. At Betterment, you choose a type of account and set a financial goal. The firm makes a recommendation in the form of a selection of ETFs for a diversified portfolio; you can choose to be more aggressive or more conservative but the basics are figured out for you. Similarly, Motif Investing offers Horizon Motifs (which are comprised of ETFs) as well as a catalog of motifs that allow investors to put money into stocks selected according to a big idea, theme, or motif. In general, account funding is similar with these firms. However, depending on how you set up your accounts, Betterment is designed to immediately purchase shares (whereas other firms require you to fund your account and then initiate a purchase separately). Choose investments for your account. If you are a beginning or passive investor, you might consider buying low-cost index mutual funds or index ETFs. ETFs are considered more tax-efficient than mutual funds but this distinction doesn't matter much if you hold the investments within an IRA. So, a simple rule of thumb would be to buy mutual funds for IRAs and ETFs for regular brokerage accounts if you want to hold both in your portfolio. Note that brokerage firms (and banks) often develop and sell their own brand of index funds. So, you might buy Fidelity funds from Fidelity, Schwab funds from Schwab, Vanguard funds from Vanguard, etc. This approach is often the simplest, though typically you can find various types of index funds at various brokerage firms at a low cost. Most brokerage firms help you find index funds among mutual funds and ETFs using screening tools. When using these tools and making a selection, consider checking annual expense ratios (these should be low) and fund management style (the style should be passive for true index funds), and compare actual performance with market indexes (these should be similar) to be sure you are truly getting an index fund. Also, you need to decide what index you want to track, such as the S&P 500 or Russell 3000. Note that #4 is typically the most involved. Launch this process within the brokerage account's dashboard. Look for webpages such as “move money,” “transfer money,” or “enroll account.” Respond to prompts that involve entering your bank's routing number and your bank account number. Then, check your bank account online to find the trial deposits made by your brokerage firm (usually, these numbers will be something like $0.22 or $0.34). Next, enter the trial deposits on the broker's website to verify a) you are the owner of the bank account and b) you authorize transactions between the brokerage and bank accounts. Hopefully, setting up the link to facilitate an ACH transfer (not a wire transfer) between the bank and brokerage firm is easy. But if you have problems (I was once stumped by one of the major firms because its process was more cumbersome than others), call a customer service representative to help you deal with the problem. Alternatively, fund your account by bringing a check to a branch if your brokerage firm has offices in your town. You may also be able to mail a check, account deposit form, and other necessary documents to the brokerage firm. I like the convenience of online transfers. By setting up this link, I can readily buy more shares of the index fund I select, initiate a position in a new index fund, start or discontinue automatic investing, and transfer funds from the brokerage firm to my bank account. Finally, to get started, decide what you want to buy and be sure you have the funds to cover the purchase of your selected investment. If you choose a mutual fund, you'll need to make sure you have enough money to make an initial investment plus any transaction charges. If you choose an ETF, you'll need to have enough money to purchase one share plus any transaction charges. Many index funds don't carry transaction charges but check to make sure. To execute the transaction, find the mutual fund or ETF listing (such as SWPPX for Scwhab S&P 500 Index Fund) and follow the prompts. Typically, you'll click on “buy” or “trade,” enter the amount you want to buy (a dollar amount or number of shares), and then confirm the order. An order may be filled immediately (for ETFs, if you purchase at the market price) or after the close of the trading day (for mutual funds). That's it! I've gone into detail for those who may be interested in the finer points of getting started in investing. But after you've opened an account and set up the banking connection, buying and selling shares is pretty easy.